Who says you can’t enjoy good food on busy mornings? These healthy breakfast recipes are quick, easy, and satisfying! I put out the call to some of my favorite parenting and family food bloggers for their best healthy breakfast recipes for busy moms and they did not disappoint! Breakfast is my favorite meal of the day and if you’re trying to maintain a healthy weight, it is the most important meal of the day! Eating a nutritious breakfast gets your metabolism going and provides much-needed energy for the busy day ahead. However, I know that most (if not all) of us are in a hurry in the mornings, so we need healthy breakfast recipes that are also EASY and FAST. Read on for an awesome collection of healthy breakfast recipes that are perfect for busy mornings, or eating on the run! The Perfect Healthy Smoothie (The Soccer Mom Blog) – This is mine and my husband’s recipe that we’ve perfected over the past few years, so I might be a little bit biased. BUT this smoothie is packed with fruits and veggies and provides a natural energy boost to start your day. It’s also a gorgeous hot pink color, so it looks as amazing as it tastes! It’s also vegan and dairy free. Favorite Green Smoothie Recipe (My Think Big Life) – This is my mom’s recipe and she swears by it! Well, she must be doing something right, because she looks AMAZING and ten years younger than her actual age. Strawberry Banana Breakfast Smoothie (Dinner with the Rollos) – This is a super easy recipe with ingredients you might already have on hand at home. Plus it’s got a dose of extra fiber! No Bake Granola Balls (Red Ted Art) – Simple, wholesome ingredients that don’t require cooking! These are especially handy for breakfast on the go AND there is a tip for making sure that your kids will love them too! Loaded Oatmeal Bowl Cookies (Your Thriving Family) – Don’t throw browning bananas away! This recipe turns them into delicious healthy breakfast cookies that you can make ahead and freeze for days you’re in a hurry. Breastfeeding Cookies (Your Thriving Family) – Even though these are made with ingredients specifically meant to help increase milk supply, they are delicious enough for the whole family to eat! (That is if you want to share!) This recipe includes lots of tips to tailor the cookies to your own dietary needs (dairy free, gluten free, and lower sugar modifications). Whole Grain Blueberry Pecan Granola Panackes (Playground Parkbench) – I am drooling over these pancakes! They’ve got a lots of protein and fiber and other goodies. Making them gluten free and lactose free is easy: simply substitute gluten free pancake mix and almond milk! Wholemeal Banana Pancakes (Danya Banya) – Only 4 ingredients and no added sugar! Easy-peasy and healthy! Gluten-Free Nutella Breakfast Crepes (The Soccer Mom Blog) – This is actually a pancake recipe that didn’t turn out exactly like I expected…and I’m GLAD! These days I save Nutella for special occasions, and instead I top with a spread of natural peanut butter and sliced bananas. It’s one of my favorite weekend breakfasts to make for the girls! Easy Paleo Sausage & Egg Breakfast Muffins (The Soccer Mom Blog) – Two ingredients…it doesn’t get much easier than that! They hold well in the fridge, so this is the perfect recipe to prep ahead for the whole week. All you have to do is just pop in the microwave for a few seconds and you’re ready to go! Breakfast Pizza (The Soccer Mom Blog) – Forget cold leftover pizza! This one is made fresh and good for you! It’s got an egg crust, so it’s grain free and perfect if you’re trying to cut back on carbs. Farmer’s Market Scrambled Eggs (Beauty Through Imperfection) – Scrambled eggs are one my go-to breakfast staples, because they are so easy and I can toss in whatever veggies I have in the fridge! Ultimate Breakfast Quesadilla (Nerdy Mama) – Eggs in a quesadilla = awesome!! Sub veggie cheese and corn tortillas for a lactose free and gluten free version. Breakfast in a Mug (Beauty Through Imperfection) – I’ve never tried cooking eggs in a mug, but you can bet I will be after seeing this!! 5 minutes only one dish used! Apple Pie Oatmeal (Rhythms of Play) – Oatmeal that tastes just like apple pie? (But without all the bad stuff!) Say no more…I’m sold!! Toasted Coconut & Cherry Quinoa Hot Cereal (The Soccer Mom Blog) – Quinoa is an excellent source of protein, which is one of the reasons it’s considered a superfood. We added some healthy (and delicious!) mix-ins to really make this a super way to start your day! Vegan Brussels Sprouts Hash (The Soccer Mom Blog) – YES, Brussels sprouts for breakfast — just trust me! If you try this recipe you’ll be a believer! This is the perfect side dish for breakfast or brunch, but it is also perfectly capable of standing on its own. It doesn’t get much healthier (or tastier!) than this! 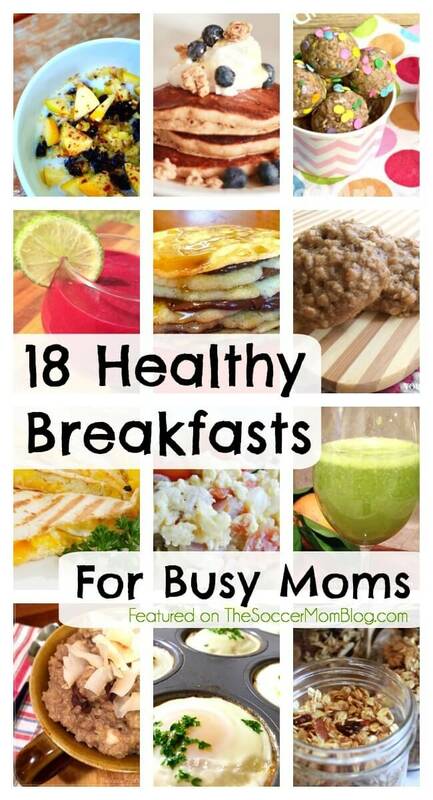 Head on over to our friends at KCEdventures for 20 Healthy Breakfast Ideas for Kids! For more healthy recipes, check out the Top 30 Most Popular Healthy Recipes of 2015 on the Soccer Mom Blog! « Roth IRA vs 529: Which is Better for College Savings?